For external use only. Not for internal use. Keep out of reach of children. If irritation, redness or discomfort occurs, discountinue use and consult a licensed health care practitioner. Keep out of reach of children. 100% Pure, Organic Sea Buckthorn Oil (Hippophae rhamnoides) (99.5%), Tocopherol (Vitamin E)(Antioxidant to preserve the freshness of the oil). Rosehip Seed Oil should not smell like Roses and should be dark amber. This was. Rosehip Seed Oil will go rancid easily so I put mine in the refrigerator. The smell was different, but storing it in the refrigerator reduces the smell and once it interacts with skin that smell isn't there (rub it in). It's not cooking oil smell and it's not a rancid smell either. I bought this for scars and stretch marks as some claimed it works and I'm 100% positive this is making a difference and reducing them. 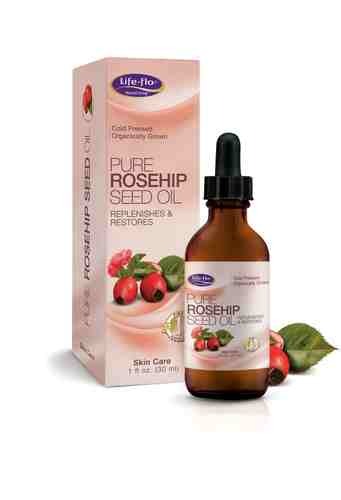 It seems the claims Rosehip Seed Oil repairs damaged skin are not ficticious. Still working with it and spent hours trying to figure out what's the real deal with Rosehip Seed oil versus phony and versus rancid, but the proof for me was does it work, does it repair skin and this sure does appear to so far. No breakouts with this, unlike many other products.